But one part of the story remained a tantalizing secret: the author’s identity. 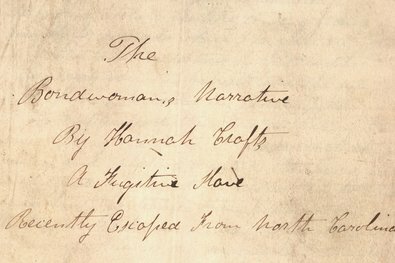 That literary mystery may have been solved by a professor of English in South Carolina, who said this week that after years of research, he has discovered the novelist’s name: Hannah Bond, a slave on a North Carolina plantation owned by John Hill Wheeler, is the actual writer of “The Bondwoman’s Narrative,” the book signed by Hannah Crafts. Beyond simply identifying the author, the professor’s research offers insight into one of the central mysteries of the novel, believed to be semi-autobiographical: how a house slave with limited access to education and books was heavily influenced by the great literature of her time, like “Bleak House” and “Jane Eyre,” and how she managed to pull off a daring escape from servitude, disguised as a man. The professor, Gregg Hecimovich, the chairman of the English department at Winthrop University in Rock Hill, S.C., has uncovered previously unknown details about Bond’s life that have shed light on how the novel was possibly written. The heavy influences of Dickens, for instance, particularly from “Bleak House,” can be explained by Bond’s onetime servitude on a plantation that routinely kept boarders from a nearby girls’ school; the curriculum there required the girls to recite passages of “Bleak House” from memory. Bond, secretly forming her own novel, could have listened while they studied, or spirited away a copy to read. The research also shows that Bond may have been given a man’s suit by a member of the Wheeler family who was sympathetic to her desire to flee. His work has been reviewed by several scholars who vouch for its authenticity, including Henry Louis Gates Jr., one of the nation’s pre-eminent scholars of African-American history. Professor Gates bought the obscure manuscript at auction in 2001. Professor Gates said that Professor Hecimovich’s discovery answers one of the large and lingering questions that has vexed him for more than a decade about the author of the book. The book, whose language borrows from 19th-century Gothic novels, traces the story of its narrator, who endures life as a slave on a North Carolina plantation and, aided by her light complexion, successfully escapes to the North. That tale closely mirrors the story of Bond. Enslaved on a plantation in Murfreesboro, N.C., Bond is believed to have been a self-educated woman who worked as a maid to the mistress of the house, Ellen Wheeler, assisting her with errands and personal duties, like styling her hair. But around 1857, Bond disguised herself as a boy and escaped, fleeing first to upstate New York and then to New Jersey, where she eventually married and found work as a schoolteacher. The novel, Professor Hecimovich believes, had its beginnings in the Wheeler home, where Bond could have had access to the family’s library and its writing materials, including a distinctive paper that was used to connect the novel to the Wheelers. 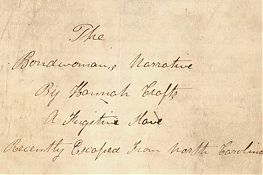 Scholars later discovered that the author borrowed passages from an array of published texts, including “Jane Eyre,” by Charlotte Brontë, and “Rob Roy,” by Walter Scott. The borrowings suggested that Bond had access to the library belonging to Mr. Wheeler, who was known to have an affection for literature. After the novel was written, its manuscript was stored in an attic in New Jersey and was little noticed until Dorothy Porter Wesley, an African-American librarian, bought it from a New York City bookseller in 1948 for $85. In 2001, Professor Gates came across the manuscript in an antiquarian catalog, which described it as a “301-page handwritten manuscript purportedly written by a female fugitive slave.” Fascinated by the discovery, he acquired it at auction with a winning bid of $8,500. After the manuscript was authenticated, major book publishers took notice, and a 336-page book was released in 2002 by Warner Books, now Grand Central Publishing. But historians still assumed, for various reasons, that Hannah Crafts was a pseudonym. Without an author, some scholars had remained skeptical that the book was written by a black woman. Professor Hecimovich, though his academic background is in Victorian literature, was intrigued by the manuscript and its author. In 2003, he set out on what became an obsessive quest to identify her, digging through archives to find relatives of the Wheeler family, conducting interviews, studying documents and working past dozens of dead ends. The road to Hannah Bond, he said, was definitely not a “straight line.” But eventually, he found her name in court and property records. Through interviews and archival research, Professor Hecimovich discovered that she had escaped from the Wheeler plantation and taken shelter with a family named Crafts in upstate New York, a possible reference to the pseudonym adopted for the book. Yet important clues about Bond’s life have not been found. In one scene in the book, Mrs. Wheeler dictates a letter to her maid. While it could be a wholly invented scene, Professor Hecimovich said that it could easily indicate that the real Mrs. Wheeler did the same with Bond. He has searched for a letter matching that description, in the hope that the letter’s handwriting would match that of the manuscript and provide even more proof that Bond the slave and the “Bondwoman” author were one and the same. But so far, he has been unsuccessful.